Softcover, 8 in. x 10 3/4 in. 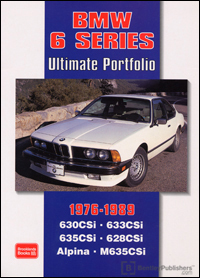 This BMW 6 Series Ultimate Portfolio: 1977-1986 is a collection of 65 original articles compiled from the pages of Autocar, Autosport, Cars & Car Conversions, Competition Car, Fast Lane, Modern Motor, Motor, Motor Manual, Motor Trend, Road & Track and Wheels. The information collected in these reprinted articles includes 20 road and track tests, plus specifications, touring and long-term reports. This is the story of the formidable 6 Series BMWs, including the Motorsport and Alpina versions, told through a collection of 65 international articles of the period. Included are road, track, race and comparison tests, new model announcements, performance data and full specifications. Professional advice is also offered on selecting a good pre-owned example.